The hillside shook beneath Brother Rufus’s feet, dust rising in a cloud around him. Three trains roared towards each other in the valley below, two black and bearing the white cross of the Knights Hospitaller, the other green and emblazoned with heathen heraldry. 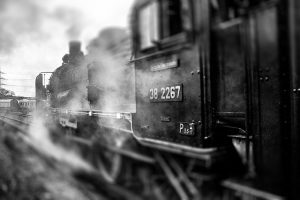 Smoke poured from their stacks as they roared across the tangled rails towards each other, cannon roaring and shot clanging off their sides. The very sight of the heathen train, powered as it was by the blood of demons, made Brother Rufus shudder. Could the demon train see into his soul from down there? Might it taint him or tempt him from the righteous path? The three trains met at the heart of the valley. Though no larger, the demon train was more powerful. Its ram tore down the side of one of the Hospitaller trains, flinging it over in a trail of tangled metal and screaming men. The other turned aside, the trains running parallel as they bombarded each other. Rufus’s hopes for his fellow crusaders crumbled as their engine was pierced and the boiler exploded, ripping the train apart. A chunk of its shell sliced into the cabin of the heathen train. That too shuddered, rocked, and fell with a crash into the dirt. His brothers had not died in vain. The enemy had fallen. Filled with trepidation, Brother Rufus walked down the hillside into the valley. He was only meant to be out here collecting botanical samples, and it was unlikely that anyone had survived that carnage, but if there was any way he could help then he should. Reaching the valley floor, he approached the remains of the second crusader train and the heathen one beside it. Corpses were littered amid the broken machinery. One of the heathen bodies rose, bloodied and ash-streaked, wide eyes staring at Rufus. Fear loosened his bladder as the man pointed at him, uttering words so alien and ugly Rufus was sure they must be a curse. He expected demons to carry him off at any moment, or that the man would lunge at him, possessed by whatever power had brought him back to his feet. Instead, the heathen turned and limped hurriedly away. Rufus’s eyes were drawn irresistibly to the remains of the demon train. He had seen those of the righteous up close, but never been so near to one like this. Ashamed at the cowardice that had dampened his robes, he determined to redeem himself. He would see what he could learn from the cursed hulk. Demon blood poured, thick and black, from the tanks on the side of the engine. Brother Rufus took a trembling step closer. He drew one of his sample jars from his bag, unscrewed the lid and let out the butterfly. His excitement at finding a citrus swallowtail this far north was nothing next to the holy cause. Careful not to let his fingers touch the unclean liquid, he dip the jar into the stinking demon blood, wiped the outside with his sleeve, and screwed the lid down on this new sample. No-one had captured the blood before, as it burst into flames when it touched the feet of the righteous. Surely this would aid the order’s martial members in understanding the enemy machines. Turning, he saw to his horror that the demon blood had spread. He stood on a small island of dirt amid a lake of the thick black liquid. It had almost reached as far as the flames still flickering in the ruin of the Hospitaller train’s fire box, a terrible reminder of the conflagration that would shortly engulf him. The blood crept closer, Rufus’s island of safety shrinking. There was only one hope. As Christ had walked on the water not far from here, could he now walk atop the blood without sinking in and so igniting it with the heat of a righteous soul? Rufus closed his eyes and prayed, more to ensure a swift journey to Heaven than out of any belief that he might survive. Then he took a step forward into the blood, expecting fire to consume him. The only heat was that of the desert wind. Eyes still closed, Rufus kept walking until the ground sloped up and his footsteps no longer raised wet slaps. Opening his eyes, he looked back. The place where he had stood was covered in demon blood. It surrounded the ruins of the Hospitaller train and was about to dribble into its firebox. “Praise be to God,” Rufus said with conviction. Then flames swept across the blood, racing towards him. With a squeal of terror, Rufus ran off up the hill, his precious sample pot still in his hand. My friend Gareth suggested that I combine the diverse subjects I’ve been writing about recently to create a single scenario – “Hospitallers driving armoured steam trains through the Middle East battling demons real & imagined…” Always up for a challenge, I took that idea and wrote this story. Thanks for the inspiration Gareth! Maybe next time I’ll try to work in The Archers as well. 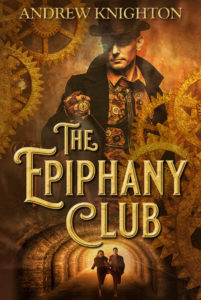 If you’re after more steampunk, my Epiphany Club books are still going cheap (and even free!) in the Smashwords summer sale. You can find them at this link, but the sale ends at the end of July, so go grab some cheap steam-powered goodness while you still can.